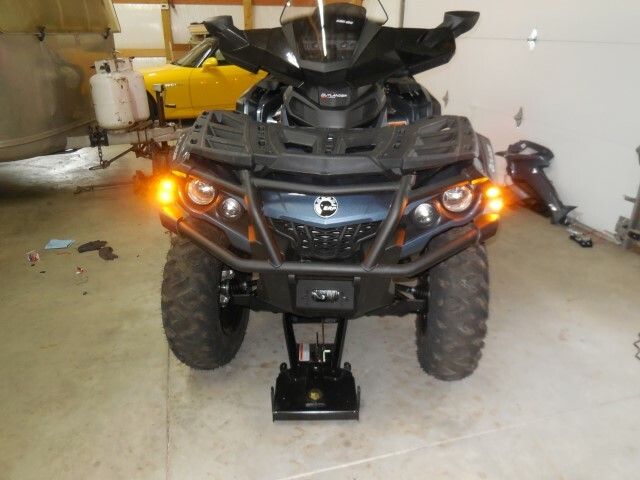 Pictures of Street Legal ATV's or SxS's Lets see pictures of your street legal ATV's or SxS. You have to develop your own plan for installing your parts. My Outlander has bumpers front and rear. 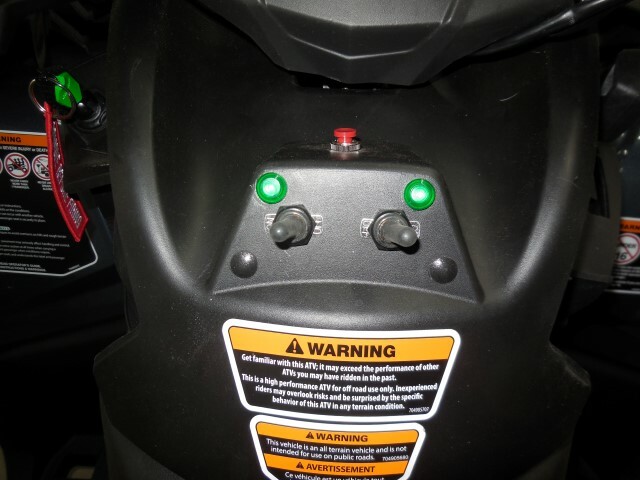 There is no adequate exposed plastic front or rear to mount the LED turn signals. I removed both bumpers and discovered plastic corner pieces had enough room under them to mount the LEDs. Good news. I routed the "red" right and "green" left turn signal cables inside the bumper pipes. I will have a little "jump" between the bumpers and the plastic body work on my Can Am, but the jump is well protected. I'm using a "right" and "left" cable (2 of them) instead of cutting into one cable. Wire is cheap and it reduces the chance of error. 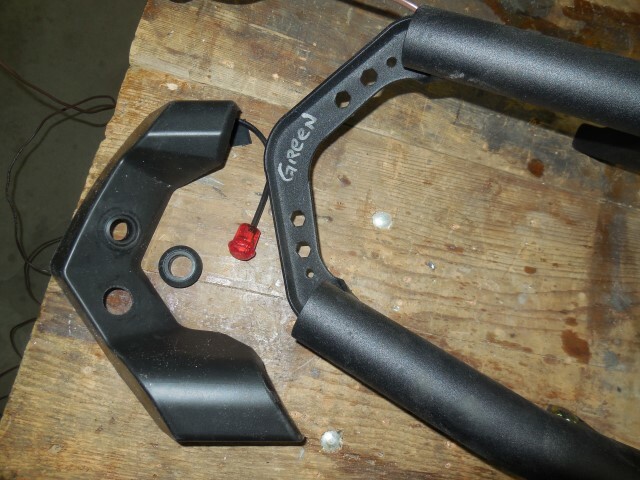 I will take these two and join them into one cable that I will run under the bodywork of the Outlander to the handlebar area where the toggles and indicator lights will be mounted. It is important to me to label each cable to insure there is no confusion later about which is right "red" and left "green" cables and wires within the cables. The white wire is ground. The next job was running the turn signal cables under the Outlander. I elected to follow the existing wiring harness where I could. I ran cables from the front and rear bumpers to the "console" area. I used wire loom under the front and rear body pieces. Now to figure out the console layout to mount the toggle switches and indicator lights and horn button. The Outlander had a "bump out" in the removable center console plastic that had just enough room for the right and left toggle switches and the indicator lights and the horn button. It is tight, especially considering I had two cables, one from the front and one from the rear bumper, and two indicator lights, a ground wire, and a horn push button with two wires. My golly I tested the turn signals and they worked! I passed the final exam! I am pleased with how bright the turn signal LEDs are. Now onto the horn. I placed the push button on top of the dash, red button. It's like a bell ringer in an old hotel. I pulled a wire from the battery positive post to the dash switch, and from the switch to the horn. I located the horn under the right front side, just behind the shock mount and radiator. I used an L bracket bolted to an upper frame cross member. I insured I had a good ground connection through the paint. Here is a photo of the location. The horn is good and loud. My Outlander came with a license plate bracket above the hitch receiver. So I just used the license plate light and wires supplied in the kit. I did not need the plastic bracket. I found the 12v and ground wires from the tail lights, and spliced into them to power the license plate light. This was straightforward. The light is nice a bright. Okay, the job is done and my Outlander has the necessary "street legal" equipment similar to a motorcycle. I had already installed Can Am rear view mirrors, which I find handy even while trail riding. My machine is no racer, just a cruiser. Looks great! Where ATV's are permitted in Maine, you are ok if it is registered and you use hand signals. Where I live, utvs get the street legal status with this kind of setup. It wouldnt matter what you put on atvs. If you live far enough out of town, then it doesn't matter anyway. Barney Fife will get you in town though. He doesn't wander out of town much though. He's too far away from being able to stop and get donuts at our local casey's. Thanks Moose: I'm sure there are many quad ATVs running on the streets with the proper equipment as we speak. Maybe more folks would show us their novel ideas to comply with their state's requirements. I took the Outlander out for a little ride today on the dirt road in front of my place since the weather was nice around here. The newly installed rear view mirrors were wonderful in keeping track of any traffic behind me. There wasn't any today. The turn signals were nice and bright in the daylight hours. I also installed EXO exhaust wrap on the exhaust system in an effort to keep the left leg a bit cooler. That stuff sure smokes and stinks when new, but it is "curing" and settling down now. 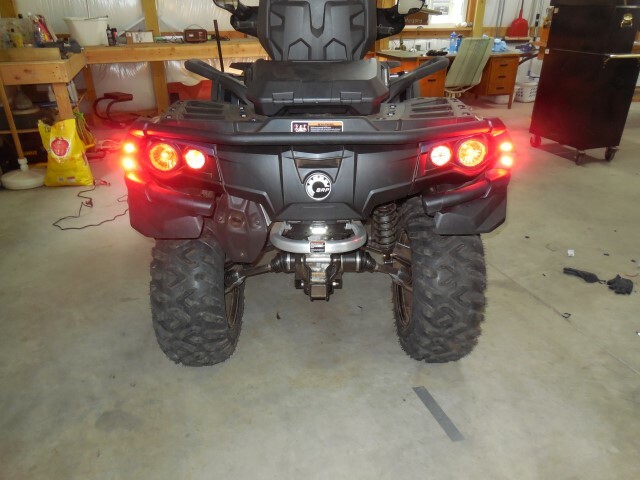 I did not realize that my Can Am Outlander has tail lights that are "always on". I thought I might have messed up when I installed the license plate light as part of my "street legal" accessories. I think "always on" tail lights help visibility on the trails as well as on the streets. I wonder if ATVs made for Europe to CE standards have always on headlights like motorcycles do. Turn signals are the most important thing for street legality. Mirrors also. Hi greg74: I agree. Normal traffic expects brake lights, turns signaled, and awareness of what's behind you. I think each state sets the requirements for street legal ATVs. For example, some may require a horn, others won't. 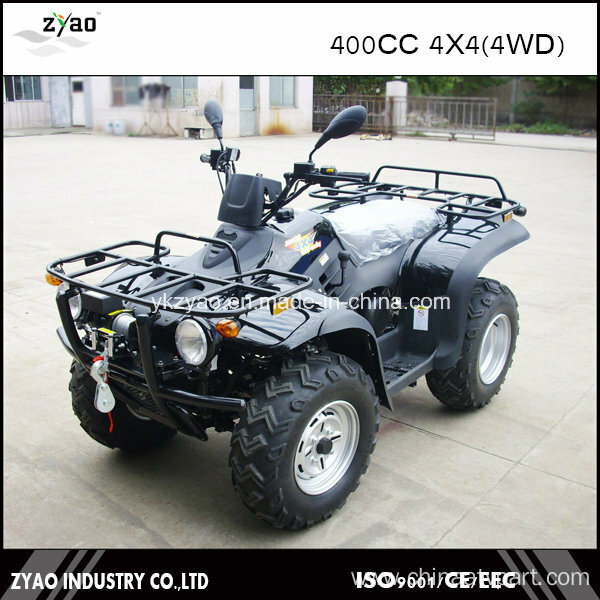 one of my customers could nt afford a name brand Quad and a New Pickup.so she bought a new 400 CC streetable Chinese Quad. and a new bare *** Chevy 1/2 ton.she put a street licence plate on the quad and rides to to town more than the pickup. she wore the original off road tires off it in a yr so i put some small car tires on it with a winter tread. that Cheap POS Chinese quad has over 20,000 kms on it..same motor. uses 20-50 synthetic oil and premium gas. she was never ever stopped by Police either? shes in her 60s..drives legal and safe.guess that helps. i think it is this quad.. was about $3000 new.